This vision is broad; it encompasses river flow and health, agriculture, food security, transportation, and many other things. It also provides a great wish list for future bike paths and routes in the area, including some already scheduled for construction. Take the jump for exciting details. GEARs endorsed the plan after making a few suggestions, including creating “bike boulevards” out of 15th Ave and High St in order to connect the Fern Ridge and River paths. One of the new paths that has me especially excited is the Springfield/Glenwood path connecting Dorris Ranch to Clearwater Park. This path was previously covered by WeBikeEugene in detail, and is scheduled for construction this summer. A proposed bridge would connect this path to the Buford Recreation Area, which would allow for a safe bike route from Springfield’s Island Park on the River Path all the way to Mt. Pisgah, with only a short stint on Springfield’s South 2nd St. This will allow cyclists to bypass the oft-flooded Franklin Ave in Glenwood. Another exciting new idea is the proposed Coburg Loop bike path, which would create an off-street alternative to the busy stretch of road connecting Coburg and Eugene. This will be a boon for cyclists wishing to ride north into the Willamette Valley who don’t want to deal with that short stretch of busy road. 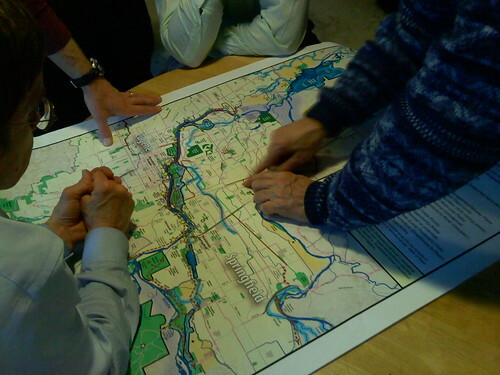 Four additional path recommendations were made by the Bicycle and Pedestrian Advisory Committee (BPAC) when they endorsed the vision plan on Thursday: A connector between Bethel and the Fern Ridge Path, a connector between High St and the River Path, a connector between Alder St and the River Path, and to make considerations for future mountain biking trails. Krueger mentioned at the BPAC meeting that the city is looking at areas of the map shaded in purple as future locations for mountain bike trails. Currently they are privately-owned quarry and gravely areas that will eventually be turned over for public use, although the timeline for these changes of ownership vary from just a few years to over 20. There are so many proposed bike paths and bridges that it’s impossible for me to cover them all here. There is a wealth of information available on LCOG’s Willamette River Open Space Vision website, including their amazing map (which I borrowed the above images from), and the full 45 page vision and action plan. The full plan is a good read, but for your convenience I’d snipped out the four pages that cover proposed bike projects and embedded them below. Another vision plan of interest is the 2003 Rivers to Ridges vision plan, which has served as a very useful guide for development in its targeted areas, including the Ribbon Trail and Arlie Property Ridgeline Extension. In fact, the Arlie Property acquisition came out of the Rivers to Ridges vision plan. Be sure to view the map PDF as well! I would love to see some kind of bike route on the south side of Pisgah. Taking the lane to get over that bridge on 58 scares the crap out of me. Next Next post: Mid-May InMotion: There is a ton of stuff going on this month!